This guide contains general information for strain gage based extensometers from Reliant Technology. For individual models, please reference the specific instructions provided with that particular model. Your Reliant extensometer should only be used for tests within its rated temperature range. Operation outside of this range can cause permanent damage to the extensometer and or cable. Moisture and water can easily damage the strain gages used in your extensometer. Short term condensation normally does not cause permanent damage, but continued exposure can degrade the strain gages and wiring and lead to early failure. If your extensometer must be used where condensation may form, the extensometer should be dried as soon as possible (placing the extensometer in an oven at 40 °C [100 °F] for a few minutes works well). Also, storing your extensometer in a its case with a desiccant is recommended. Your Reliant extensometer may be used with most non-polar liquids without causing damage. For applications where exposure to water is required, special protective coatings for the strain gages are available. Your Reliant extensometer should only be used for tests within its rated temperature range. Operation outside of this range can cause permanent damage to the extensometer and or cable. Your extensometer will perform best and last longer with regular cleaning. Isopropyl alcohol and cotton swabs can be used to remove scale, grease, and grit from the extensometer. However, do not touch or rub the strain gages and wiring with the swab and never clean your extensometer with water based cleaners. Applying light oil to the spring plungers (if equipped) will extend their useful life. All Reliant extensometers are designed for use through specimen failure. Mechanical stops are incorporated in your extensometer’s design to protect it from damage due to over-travel. However, testing through failure will increase the likelihood of the knife edges to chip or dull. This is normal wear and a spare set of knife edges is included with most models. If your extensometer becomes damaged or worn, please contact us; extensometers can typically be repaired or rebuilt to function as new. Most of Reliant’s extensometers are designed with a full, 350 Ohm, Wheatstone bridge. Recommended excitation voltage is 5 or 10 VDC , however, some manufacturers (such as Instron) use an AC excitation voltage. The output of your Reliant extensometer is proportional to the excitation voltage. This output is expressed in millivolts per volt (mV/V). For example: For an extensometer with a rated output of 2.538 mV/V, you should expect the full scale output will be 25.280 millivolts when the extensometer is excited by exactly 10 volts. The Inspection Certificate provided with your extensometer contains this data. Strain gage based extensometers are passive instruments. They can not generate their own signal and as such must be connected to some external electronics. Typically, the electronics provide the excitation voltage to the extensometer and amplify the low voltage output signal to a high level DC voltage. Your extensometer typically will require calibration with your electronics for it to read correctly. This process is generally quite straightforward and most calibration companies provide this service. For systems with a dedicated strain channel, your extensometer will typically be provided with the proper connector to directly plug-in to your electronics. For data acquisition systems or chart recorders, a signal conditioner is typically required. Reliant can provide signal conditioning electronics calibrated with your extensometer to allow direct connection to a chart recorder or data acquisition card. Extensometer calibration requires a precise tool to accurately measuring If you have many extensometers and wish to calibrate them to calibrate Reliant Technology’s model CERHV - Very High Resolution Extensometer Calibrator is an ideal way to perform extensometer calibrations. Reliant extensometers can be easily calibrated by any calibration service familiar with extensometers and materials testing equipment. If you purchased your Reliant extensometer with signal conditioning electronics, the system will be shipped fully calibrated. No further initial calibration will be required for use. For periodic re-calibration, the extensometer and electronics can be calibrated by any qualified calibration service or the system can be returned to Reliant for calibration. For a quick and easy way to verify your electronics, Reliant can provide your extensometer with our Shunt Calibration Plug. The Shunt Calibration Plug is a potted resistor(s) used to transfer or verify your extensometer’s calibration to your electronics. Complete details are provided on the Shunt Calibration Plug instruction sheet. The following procedure is typical for calibrating an extensometer. Most calibrations will be in tension. If you need to calibrate your extensometer for both tension and compression, please refer to the notes at the end of this section. An extensometer calibrator with the required measuring range, accuracy, and resolution will be needed to perform the calibration as well as the manuals for your particular test machine’s electronics. Mount your extensometer on the calibrator following the procedures specified for your particular model. The extensometer should be connected to the electronics and allowed to “warm up” for a period specified by the unit’s manufacturer. With any zero setting device removed from the extensometer, “tare” or “offset” the calibrator’s display to read zero. Exercise the extensometer two to three times by running it from its initial position to its maximum full range travel and back. With the calibrator returned to its initial position (zero), “tare” or “offset” the electronics to also read zero (your machine may have an auto-zero or auto-tare button to accomplish this). For older machines, you may be required to adjust a zero potentiometer. Next, the calibrator is adjusted to accurately set the extensometer at a desired position. For some controls this position may be the full scale travel of your extensometer. For example, the full scale travel of a 2 inch gauge length extensometer with 25% measuring range. Note: Because accuracy is typically more important in the lower part of the strain range, Reliant recommends choosing a mid-range position if possible. The lower end of the extensometer’s measuring range will contain date for modulus of elasticity or yield strength. For this reasons, ASTM requires greater accuracy in the lower part of the measuring range. 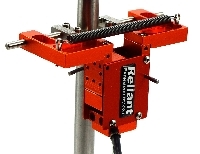 Reliant recommends adjusting the gain to some position near ½ of extensometer’s full scale measuring range. This will optimize the accuracy of the extensometer at the lower strain levels where the data is more important. For example, a 25 mm gauge length extensometer with a 10% measuring range, will have a full scale measuring range of 2.5mm (25mm * 10% = 2.5 mm). The displacement at ½ of the full scale measuring range is 1.25mm (2.5 mm * 50% = 1.25mm). For this particular extensometer, Reliant recommends adjusting the calibrator to read 1.25 mm (50% of FS range), and setting the electronics to read this as precisely as possible. This will weight the calibration to provide higher accuracy in the 0 to 1.25 mm measuring range. Calibrating your extensometer in this way may increase the error at the far end of the measuring range (2.5 mm), but errors in this area are of less importance. Note that either calibration method should be acceptable. All Reliant extensometers are designed for high accuracy and linear output. They can typically be calibrated using either method. Return the calibrator to its initial (zero) position. The output will typically not return to exactly zero, but a small offset value from zero. This is due to a small amount of hysteresis in the strain gauged flexure. The offset should be very small (0.5% of F.S.). Note: If you see a much larger offset, the extensometer’s knife edges may be worn and slipping on the calibrator’s mounting posts. Re-set the electronics to read precisely zero and return the calibrator to the position you previously used to calibrate the extensometer. The output at this position should be very close to the value you read in step 4. Note for extensometers with tension and compression travel: Standard industry practice is to perform separate calibrations for both tension and compression. 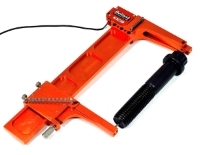 Most Reliant extensometer models are designed for tension and compression travel. Calibrating the compression range is not required if you are not doing any tests in compression. 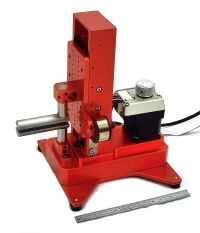 Some test machines allow for separate calibrations in tension and compression. If your system has this capability, the calibration procedure should be outlined in your machine’s manuals. These systems usually allow different slopes for tension and compression calibration. The shunt calibration method can also be used to set-up your electronics based on the inspection certificate provided by Reliant. The inspection certificate contains this data in mV/V, % strain, and VDC. To perform the shunt calibration, a shunt resistor with the resistance value specified on the inspection certificate is placed across one arm of the Wheatstone bridge, and the shift in output is recorded. This output shift may be displayed in millivolts, % strain, or Volts DC. With the extensometer attached to a specimen at its gage length setting (zero pin carefully removed if so equipped) and zero the electronics. Next, engage the shunt calibration resistor and adjust the conditioner’s gain to arrive at the precise reading listed on the inspection certificate. Many strain gage signal conditioners allow for shunt calibration. They often provide a location on the conditioner’s board for the resistor to be soldered. It is important that the resistor(s) be placed across the correct leads specified by the shunt calibration data. Most tension calibrations will be between RED and GREEN leads.